Preheat oven to 375°F. Line a rimmed baking sheet with aluminum foil. Place a wire cooling rack or oven rack on top of the baking sheet. Arrange the bacon on the rack. Cook for 10 minutes. In a bowl, combine the brown sugar, beer, and cayenne pepper, whisking for form a syrup. Remove the bacon from the oven and brush both sides of the bacon with the beer syrup. Return the bacon to the oven and cook for 7-10 minutes. 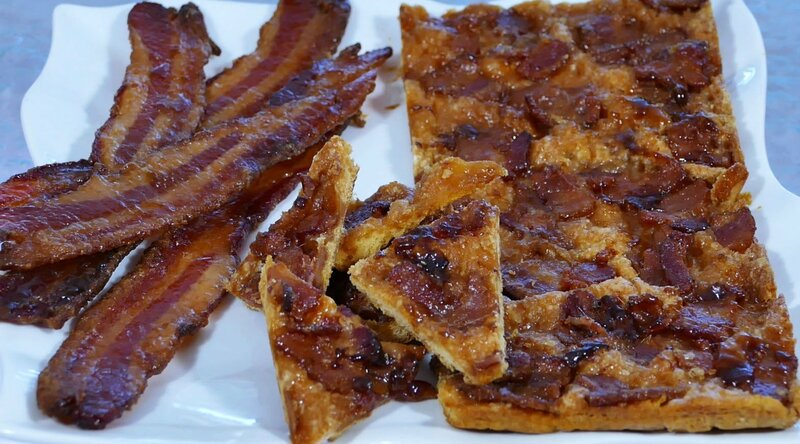 Repeat the process until the bacon is browned and syrup is used up (do not burn the bacon). Cool to allow bacon to harden (about 10 minutes). Preheat oven to 325°F. Line a 9x12 inch baking sheet with parchment paper and spray with cooking spray. In a medium skillet, cook the bacon until almost done (about 5 minutes). Transfer to a plate with paper towels, to drain. Roll out crescent rolls or puff pastry onto parchment. Pinch seams to make one single sheet. Prick all over with a fork. Drizzle with half of the maple syrup. Sprinkle a half cup of brown sugar over the dough. Top with the cooked bacon, distributing evenly. Sprinkle the remainder of the brown sugar and drizzle with the remaining maple syrup. Bake for about an hour, or until golden-brown (note: it could take less than an hour, depending on your oven). Let cool and harden completely before slicing into pieces.